This Green Bloody Mary is perfect for St. Patrick’s Day but delicious any time of the year! Made with tomatillos, yellow tomatoes horseradish for a great kick. 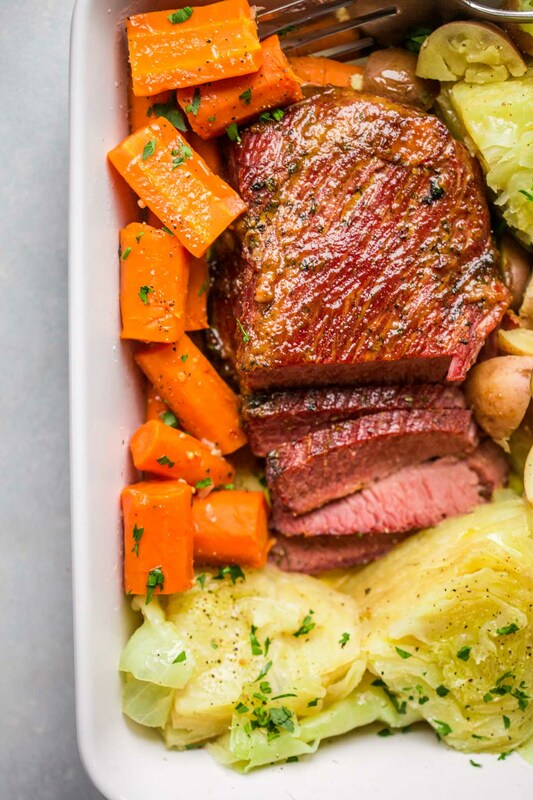 I love corned beef – As a child, I used to ask for it on my birthdays. Now, I make it on my own, either in the Instant Pot or the Slow Cooker. Who doesn’t love a holiday surrounded by adult beverages? My name is part of the holiday saying: Erin Go Braugh! So, why don’t we prepare a festive cocktail for this emerald holiday? Green Bloody Marys. 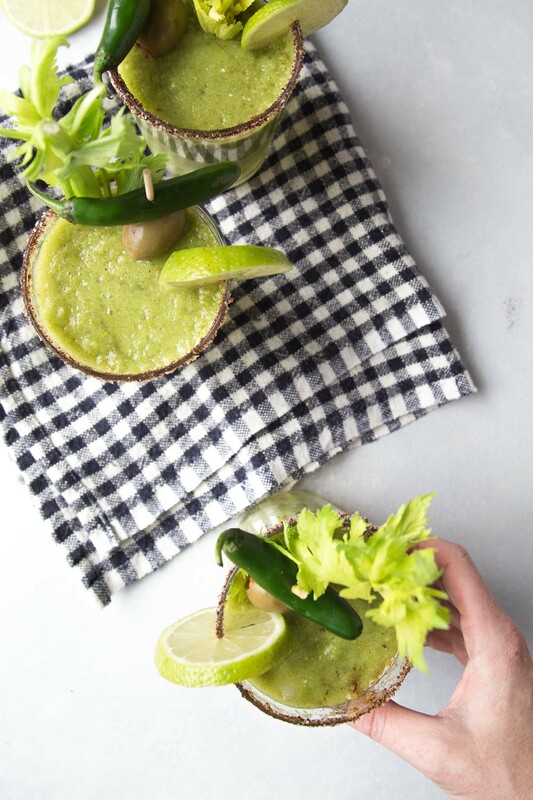 This Green Bloody Mary is a lot like the original tomato version, but it’s made with tomatillos and yellow tomatoes instead of the traditional red variety. Which also brings me to think – Should these even be called Bloody Marys, since they’re no longer red? Regardless, they’re delicious! When I first created this recipe, I made a jalapeno infused vodka to add to the Bloody Marys. But, over time, I’ve found that it’s not necessary. Instead, I just blend up that jalapeno into the Green Bloody Mary mix to give it a good bit of heat and flavor. If you’re not in to spicy bloody marys, you can definitely skip the jalapeno, or halve the amount, but I really didn’t find this to be too spicy at all. You could even spice this up a bit more at the end with a few dashes of hot sauce. How will you be celebrating St. Patrick’s Day this year? It’s on a Saturday this year, so it should be an extra festive occasion if you’re one to go out. But me, I’ll be celebrating with friends at home, with some yummy corned beef and cabbage and lots of amazing wine (rather than beer)? I’d love to hear your plans in the comments below! 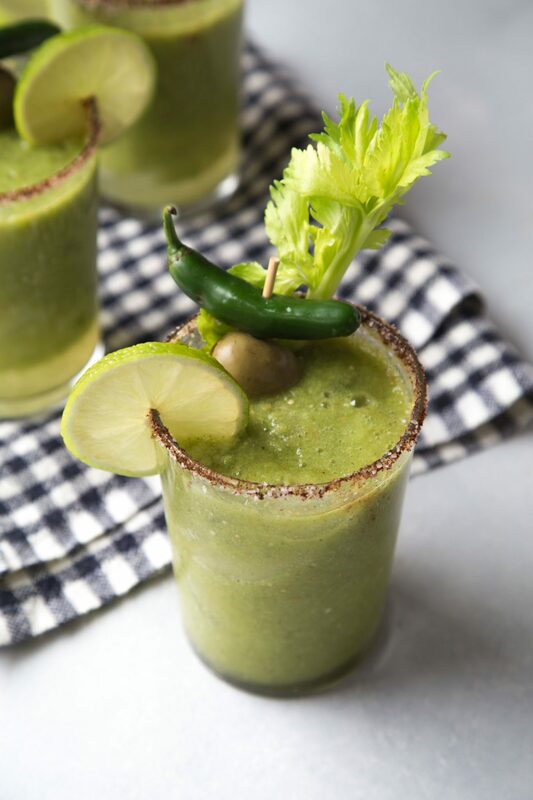 This Green Bloody Mary is perfect for St. Patrick's Day but delicious any time of the year! Made with tomatillos, yellow tomatoes horseradish for a great kick. 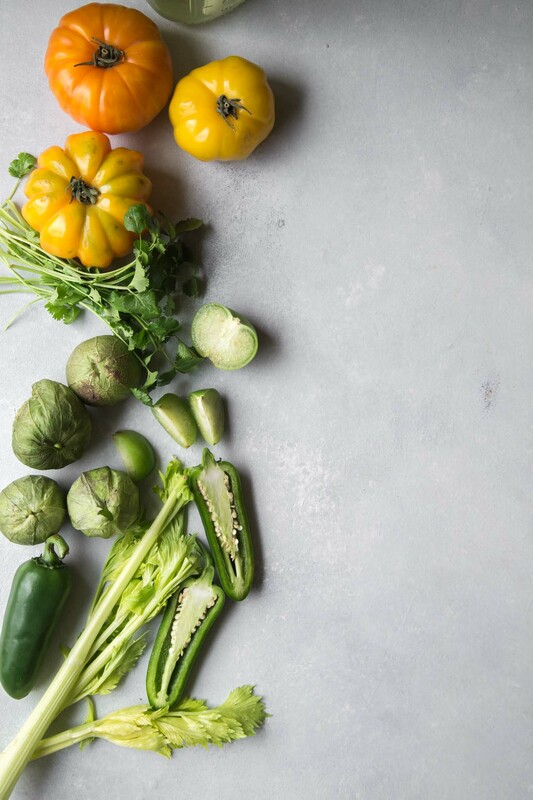 Cut the tomatoes, tomatillos, celery and jalapeno into large chunks. Add to your blender along with chopped cilantro, horseradish, water and spices. Process until smooth. Taste and adjust your seasonings as desired. If you prefer a thinner bloody mary, strain the mixture through a fine mesh strainer. For a thicker cocktail, serve as is. I prefer to strain half of my mixture and then combine it with the thick, for a medium consistency. To rim your glass, combine a mixture of 1/2 kosher salt and 1/2 chili powder in a small rimmed dish. Run a lemon around the lip of your glass and then dip it into the salt to coat. Add 1-1/2 ounces vodka to your glass and top with the bloody mary mix. Garnish with a celery stick and skewered tomatoes. 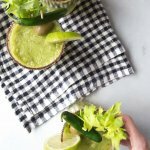 If you loved this Green Bloody Mary I would appreciate it so much if you would give this cocktail recipe a star review! Also, be sure to snap a picture of your finished bloody mary and share it with me on Instagram using the hashtag #platingsandpairings and tagging me @platingsandpairings. This is perfection!! I want one at right now o’clock! Beautiful photos too! Right now o’clock sounds just about perfect Jaime! Fantastic photos. You should be proud of them! The drink looks inviting also. Nice job. Just in time for the weekend! The jalapeño vodka sounds incredible. No way I can wait until the next St Patrick’s Day for this! Sharing now! Now is the PERFECT time! Enjoy!!! oooh! I need this today! It is Friday, so I deserve it!! I love the colour of this “bloody” mary!! It looks phenomenal! Thanks Dini – Isn’t the color fab? I like changing things up a bit! You are speaking my language here! 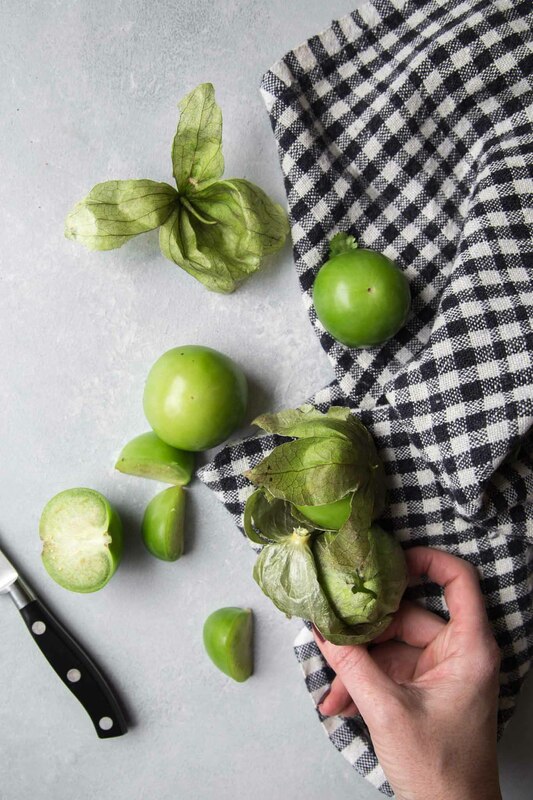 I way prefer tomatillos over tomatoes in salsas – so I know I would love this! Ooohhh – You’ll love this then Pam! Enjoy! I’ve never seen a green bloody mary in my life! But this is a sight for sore eyes. Gotta try this next week! I hope you give it a try Levan – I’d love to hear back on how you like it! Hi Shannon – Congratulations to you! You can definitely make this without the alcohol. When pureeing the mixture, add a couple of slices of jalapeno (depending on how spicy you like it) and a 1/4 cup of water. This should get it to the same consistency and spiciness as it would if you had used the infused vodka. Hope this helps! this is gorgeous! and I would totally feel healthy drinking this because it’s green! does that count? Totally – It’s like a salad in a cup Georgie! Love the color! My husband is adamant that we have corned beef every St. Patty’s day. I’d never had it before so at first I was skeptical, but now I look forward to the fun tradition! 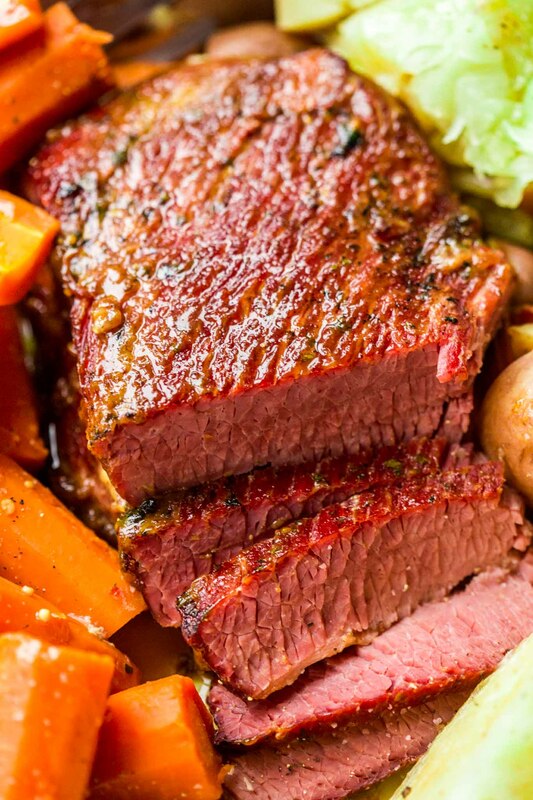 I absolutely LOVE corned beef – I’m glad you learned to love it too Kelsey! This is so creative! I love bloody mary’s but I never would have thought of making a st patty’s Day themed one. Great recipe! Thanks Megan – I hope you have a fantastic St. Patrick’s Day! Now this would be a nice start to that Saturday St. Pattie’s day! You inspire me! Bloody Mary’s are a favorite of mine but I have yet to have a green one – this sounds fantastic! Thanks Lindsay – Happy St. Patrick’s Day! Part a day ahead of time?